Everybody have a love-hate story with this king of fruit. 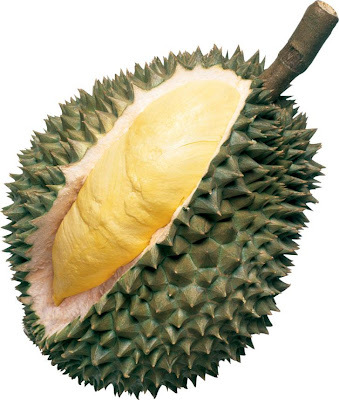 Some are crazy about it, some just hate the sight and smell of it, some only loves to take the fermented durian. Anyhow, tempoyak is one-of-a-kind that cannot be compared to anything else in this world. It's almost indescribable. The internal flesh of a durian..
Fermented durian is used as an additional flavor in Malaysian cooking such as Pucuk Ubi Masak Tempoyak, soup base, bread jam or it can be eaten on its own whether fried or raw. To make tempoyak is pretty simple. 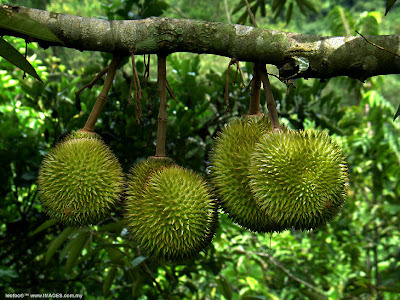 Separate the seed from the flesh, mix well the durian flesh with salt. The quantity ratio is about 1 cup of durian flesh to 1 table spoon of salt. You may need to to trial-and-error on the ratio. Only beware that lack of salt will cause your tempoyak to become sour. Put too much, and of course your tempoyak will become too salty. Keep the mixture in an airtight container, and it is ready for consumption minimum 2 days thereafter. Tempoyak well preversed can last for years, especially if it is kept in refrigerator. Please browse our website for more cooking which use tempoyak as an ingredient. Note : Some people put a bit of sugar to add sweetness. From my personal experience, if the salt-tempoyak ratio is right, it is not necessary to add additional sugar, especially if you are using fresh durian flesh. You may want to add-in sugar to your cooking if your fermented tempoyak is using not-so fresh durian though. I have been asking around for some time about making tempoyak until I found your post. Thank you! I am planning to make this tempoyak in order to make the cacah for ambuyat... here in New York City, USA! I have a big question - I cannot find binjai here (I tried so hard! ), but I DO have cencaluk, tempoyak, limau kesturi, chilies, etc... can I still make cacah?? Can you give me a recipe?